Two billion tons of aggregate are produced every year in the US. Production of aggregate is expected to reach 2.5 billion tons by 2020, which raises concerns about where the new aggregate will come from. (5) One alternative to using virgin aggregate is recycled concrete aggregate. Recycled concrete aggregate (RCA) consists of high-quality, well-graded aggregates (usually mineral aggregates), bonded by a hardened cementitious paste. The aggregates comprise approximately 60 to 75 percent of the total volume of concrete. RCA is generated through the demolition of Portland cement concrete elements of roads, runways, and structures during road reconstruction, utility excavations, or demolition operations. In many metropolitan areas, the RCA source is from existing Portland cement concrete curb, sidewalk and driveway sections that may or may not be lightly reinforced. The RCA is usually removed with a backhoe or payloader and is loaded into dump trucks for removal from the site. The RCM excavation may include 10 to 30 percent subbase soil material and asphalt pavement. Therefore, the RCA is not pure Portland cement concrete, but a mixture of concrete, soil, and small quantities of bituminous concrete. The excavated concrete that will be recycled may be hauled to a central facility for stockpiling and processing or processed on site using a mobile plant. During processing crushing, screening, and ferrous metal recovery operations occur. Present crushing systems, with magnetic separators, are capable of removing reinforcing steel without much difficulty. Welded wire mesh reinforcement, however, may be difficult to remove. In 2004 the Federal Highway Administration conducted a five state scanning tour to review the state of the art with regard to the use of reclaimed concrete,(5) The final report provides valuable information regarding current practices for using RCA. 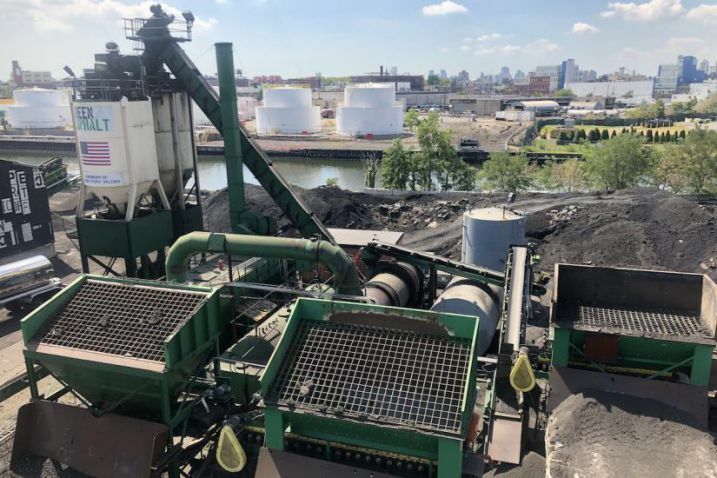 Recycling concrete is on the rise and saves valuable resources, especially when the RCA is recycled and reused within the same metropolitan area, cutting down on fuel emmisions. (2,3,5) Recycling RCA has proven to be very cost effective. (6) RCA can be used as an aggregate for cement-treated or lean concrete bases, a concrete aggregate, an aggregate for flowable fill, or an asphalt concrete aggregate. It can also be used as a bulk fill material on land or water, as a shore line protection material (rip rap), a gabion basket fill, or a granular aggregate for base and trench backfill. The interactive recycling map below shows where reclaimed concrete material is used in various applications including using it as aggregate, aggregate base, and using it in Portland cement concrete (PCC). Disposal in landfills, near the right-of-way, and in borrow pits or depleted quarries has historically been the most common method of managing RCA. However, recycling has become a more attractive option, particularly in aggregate-scarce areas and in large urban areas where gathering and distribution networks for RCA have been developed. RCA can usually be obtained from central processing plants where the processed material is stockpiled and sold. Well-processed RCA will normally yield consistent physical properties, but RCA properties can sometimes vary depending on the properties of the quality of the recovered concrete. Variations between concrete types result from differences in aggregate quality, aggregate size, concrete compressive strength, and uniformity(9) For instance, aggregates in concrete not exposed to severe weathering (such as footings and covered structural members) can contain a higher proportion of deleterious substances than those in pavement concrete. Precast concrete generally has smaller aggregate size, higher compressive strength, and less variation in strength and other properties than cast-in-place concrete. Some recycled pavements may show evidence of distress from alkali-silica reaction due to the presence of a siliceous aggregate with reactive constituents. In areas where deicing salts are extensively used, recycled concrete may contain relatively high levels of chlorides. The use of RCM as an aggregate substitute in pavement construction is well established, and includes its use in granular and stabilized base, engineered fill, and Portland cement concrete pavement applications. Other potential applications include its use as an aggregate in flowable fill, hot mix asphalt concrete, and surface treatments. To be used as an aggregate, RCA must be processed to remove as much foreign debris and reinforcing steel as possible. Reinforcing steel is sometimes removed before loading and hauling to a central processing plant. Most processing plants have a primary and secondary crusher. The primary crusher (e.g., jaw crusher) breaks the reinforcing steel from the concrete and reduces the concrete rubble to a maximum size of 75 mm (3 in) to 100 mm (4 in). As the material is conveyed to the secondary crusher, steel is typically removed by an electromagnetic separator. Secondary crushing further breaks down the RCM, which is then screened to the desired gradation. To avoid inadvertent segregation of particle sizes, coarse and fine RCM aggregates are typically stockpiled separately. Processed RCA, which is 100 percent crushed material, is highly angular in shape. Due to the adhesion of mortar to the aggregates incorporated in the concrete, processed RCA has rougher surface texture, lower specific gravity, and higher water absorption than comparatively sized virgin aggregates. As processed RCA particle size decreases, there is a corresponding decrease in specific gravity and increase in absorption, due to the higher mortar proportion adhering to finer aggregates. High absorption is particularly noticeable in crushed fine material, which is less than 4.75 mm in size (minus No. 4 sieve size), and particularly in material from air-entrained concrete (since there is substantially more air-entrained mortar in the fine than the coarse RCA aggregates). The minus 0.075 mm (No. 200 sieve) fraction is usually minimal in the RCA product. Some typical physical properties of processed RCA are listed in Table 1. The cement paste component of RCA has a substantial influence on RCA alkalinity. Cement paste consists of a series of calcium-aluminum-silicate compounds, including calcium hydroxide, which is highly alkaline. The pH of RCA-water mixtures often exceeds 11. RCA may be contaminated with chloride ions from the application of deicing salts to roadway surfaces or with sulfates from contact with sulfate-rich soils. Chloride ions are associated with corrosion of steel, while sulfate reactions lead to expansive disintegration of cement paste. RCA may also contain aggregate susceptible to alkali-silica reactions (ASR). When incorporated in concrete, ASR-susceptible aggregates may cause expansion and cracking. The high alkalinity of RCA (pH greater than 11) can result in corrosion of aluminum or galvanized steel pipes in direct contact with RCA and in the presence of moisture. Similarly, RCA that is highly contaminated with chloride ions can lead to corrosion of steel. Processed coarse RCA, which is greater than 4.75 mm in size (No. 4 sieve size), has favorable mechanical properties for aggregate use, including good abrasion resistance, good soundness characteristics, and bearing strength. Typical mechanical properties are given in Table 2. Los Angeles Abrasion loss values are somewhat higher than those of high-quality conventional aggregates. Magnesium sulfate soundness and California Bearing Ratio (CBR) values are comparable to conventional aggregates. Table 2. Typical mechanical properties of reclaimed concrete material . * Typical CBR value for crushed limestone is 100 percent. For RCA, environmental considerations have focused on leachability of contaminants and pH changes from RCA storage and use. Previous research conducted on the leachability Portland cement concrete used the Toxicity Characteristic Leaching Procedure. (10) Although leachability results were low(10), the TCLP simulates a municipal landfill setting and not a beneficial use environment, so results would not be applicable to environmental considerations for beneficial use. More recent research employed a serial batch test (Dutch Pre-Standard NVV 5432). (11) This research concluded that well-cured Portland cement concrete released no detectable concentrations of antimony, arsenic, beryllium, cadmium, chromium, lead, mercury, nickel and selenium. (11) The internal alkaline nature of concrete is well known, but can change over time with weathering and age for numerous reasons (e.g., carbonation). RCA could also be alkaline, with potential pH values and changes similar to in-place concrete. Texas has also completed research in using RCA in mechanically stabilized earth (MSE) berms that involved thorough material characterization, pH measurements and an evaluation of use. (15,16) They concluded that pH and resistivity specifications for MSE wall backfill materials should be waived for crushed concrete, concrete structures that have suffered sulfate attack should not be crushed and used as backfill in MSE walls, and MSE walls with crushed concrete backfill should include adequate drains and high permittivity filter fabrics behind the wall to avoid drainage problems. (16) The potential for a pH and drainage issues leads some jurisdictions to require that RCA stockpiles be separated (a minimum distance) from water courses. ACPA. Concrete Paving Technology : Recycling Concrete Pavement, American Concrete Pavement Association, Skokie , Illinois , 1993. ECCO. In-Place Concrete Pavement Recycling Makes a Green Statement, Environmental Council of Concrete Orgainzations, 1997. ECCO. Recycling Concrete Saves Resources, Eliminates Dumping, Environmental Council of Concrete Orgainzations, 1997. ECCO. Recycling Concrete and Masonry, Environmental Council of Concrete Orgainzations, 1998. FHWA, Transportation Applications of Recycled Concrete Aggregate, FHWA State of the Practice National Review, September 2004. Hanks, A. J. and E. R. Magni. The Use of Recovered Bituminous and Concrete Materials in Granular Base and Earth, Report MI-137, Ontario Ministry of Transportation, Downsview, Ontario 1989. Petrarca, R.W. and V.A.Galdiero. 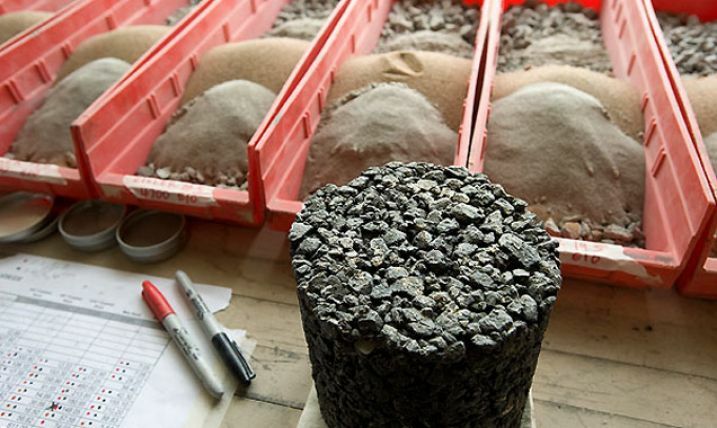 "Summary of Testing of Recycled Crushed Concrete," Transportation Research Record No. 989 , pp. 19-26, Washington , DC , 1984. Yrjanson, William A. Recycling of Portland Cement Concrete Pavements , National Cooperative Highway Research Program Synthesis of Highway Practice No. 154, National Research Council, Washington , D.C. , December, 1989. Kreitch, A.J. Leachability of Asphalt and Concrete Pavements, Heritage Research Group Report, Indianapolis, Indiana , March 1992. Hilliera, S.R., Sangha, C. M., Plunkettb, B. A., Waldena, P. J., Long-term leaching of toxic trace metals from Portland cement concrete, Cement and Concrete Research, Vol. 29, p. 515-521, 1999. Shanmugam, Harini, Assessment and mitigation of potential environmental impacts of Portland Cement Concrete highway grindings, Thesis, Washington State University, 2004. Ohio Department of Transportation, Recycled Materials Report, Box Test. Steffes, R., Laboratory Study of the Leachate from Crushed Portland Cement Concrete Base Material, Iowa Department of Transportation, September 1999. Ellen M. Rathje, Alan F. Rauch, Kevin J. Folliard, David Trejo, Dallas Little, Chirayus Viyanant, Moses Ogalla, Michael Esfelle, Recycled Asphalt Pavement and Crushed Concrete Backfill: State-of-the-Art Review and Material Characterization, Center for Transportation Research at The University of Texas at Austin, Texas Department of Transportation, Octboer, 2001. Rathje, E., Rauch, A., Trejo, D., Folliard, K., Viyanant, C., Esfellar, M. Jain, A., Ogalla, M., Evaluation of Crushed Concrete and Recycled Asphalt Pavement as Backfill for Mechanically Stabilized Earth Walls, Center for Transportation Research at The University of Texas at Austin, Texas Department of Transportation, March 2006. Reclaimed concrete material (RCM) can be used as coarse and/or fine aggregate in Portland cement concrete (PCC) pavements. However, concrete incorporating more than about 10 to 20 percent fine RCM aggregates can suffer a reduction in quality because of the high amount of water required to maintain adequate workability of the concrete mix. RCM has been accepted by many jurisdictions and is covered by conventional aggregate specifications and by several highway agency specifications, including those in Colorado, Connecticut, Illinois, Indiana (special provisions), Iowa, Louisiana, Michigan, Montana, North Dakota, Oklahoma, and Wyoming. (14) For large projects and/or projects where suitable quality aggregate is not readily available, site-processed RCM can be significantly cheaper than new aggregate hauled to the site. When RCM is collected from different sources or types of concrete, it should either be blended with other aggregates or separately processed and placed in separate stockpiles to ensure uniformity of RCM aggregate properties. Crushing and screening is required to produce aggregate within the limits for concrete mix gradation. Some of the engineering properties that are of particular interest when RCM is used in Portland cement concrete applications include gradation, particle shape, specific gravity, absorption, moisture content, durability, and permeability. Gradation: Recycled concrete material should be crushed and screened to produce aggregate that satisfies the AASHTO M6(3) and M80(4) gradation requirements for PCC. With appropriate adjustments, a plant can produce any desired gradation. Crushed fine aggregates (minus 4.75 mm (No.4 sieve)) are generally not used or are blended with natural sand. Shape: Processed RCM, being 100 percent crushed material, is highly angular in shape. While this shape assists in increasing the strength of the mix, it can reduce its workability. Moisture Content: The in-situ stockpile moisture content for processed RCM is typically the same as that for conventional granular material. Permeability: Coarse-grained RCM is free draining (more permeable than conventional granular material due to lower fines content). Some of the properties of concrete mixes containing RCM that are of interest include strength characteristics, workability, resistance to freeze-thaw, deleterious substances, alkali-aggregate reactivity, and corrosivity. Strength Characteristics: In RCM mixes, compressive strength can be reduced up to 25 percent compared to mixes with conventional aggregates, with up to 30 percent improvement in the damping capacity, and higher amounts of drying shrinkage and creep. (20) For a given compressive strength (at 28 days), both the static and dynamic moduli of elasticity for recycled-aggregate concrete are significantly lower (up to 40 percent) than those for concrete containing virgin aggregate. (15,22) Concrete mixes incorporating coarse RCM aggregates generally can be expected to develop about 10 percent lower flexural strength at equal water/cement ratio and slump than conventional aggregates. Resistance to Freeze-Thaw: Concrete incorporating RCM aggregates has good resistance to freeze-thaw exposure provided a suitable air void system is present in the mortar phase of the concrete containing RCM aggregate. Prior to use, trial batches should be prepared according to ACI 211 procedures(8) and necessary mix adjustments made to ensure that the specified requirements are attained. Special care is required when incorporating RCM fines to avoid dramatic reductions in concrete workability, strength, and finishability. Blending RCM fines with natural sand at substitution rates of 10 to 20 percent has resulted in satisfactory performance. Several trial mixes are often required to generate sufficient data to identify the optimum substitution rate. Due to their high absorption, prewetting of RCM aggregates is important. Aggregates that are not saturated will absorb water from the concrete mix. In addition to satisfying the requirements of AASHTO M43 and M6, consideration must be given to sulfate and chloride contamination of RCM aggregates. Chloride contamination is often due to the application of deicing salts (on pavements and sidewalks). High concentrations of chloride ions can result in corrosion of reinforcing steel. ACI 201.2R, "Guide to Durable Concrete,"(6) provides guidance on the limits of such contaminants for various service conditions. Where sulfate attack is of concern, the potential for deterioration should be evaluated by the ASTM C452 sulfate expansion test. (11) Sulfate-resistant cement such as Type II or V can be used, if necessary. Where alkali-silica reactivity is of concern, the potential for deterioration should be evaluated by the ASTM C289 test. (12) Low-alkali Type II cement can be used if necessary. For reinforced concrete pavement construction or plain jointed pavements without load transfer dowels, it is important to ensure that the top size coarse aggregate is sufficiently large (typically 40 mm) to provide adequate interlock across joints and cracks. Conventional AASHTO rigid pavement thickness design procedures are appropriate for rigid pavements incorporating RCM. The same equipment and procedures used for concrete containing conventional aggregate may be used to batch, mix, transport, place, and finish concrete containing processed RCM aggregates. However, additional care and some minor changes are necessary to avoid potential problems. The same methods and equipment used to store or stockpile conventional aggregates are applicable for RCM. It is important to monitor the moisture content of RCM aggregates in stockpiles to permit determinations of the mix water requirements. Sprinkling stockpiles to keep RCM aggregates saturated is an effective method of minimizing their potential to absorb moisture from the concrete mix. The same methods and equipment can be used to mix, place, and compact RCM concrete mixes and conventional concrete mixes. Slipforming and finishing concrete made with RCM aggregates is improved by reducing or eliminating the RCM fines content in favor of natural sand. The same quality-control procedures for conventional Portland cement concrete pavement are required for Portland cement concrete incorporating RCM aggregates. The slump, air content, and temperature of the plastic concrete should be monitored at the time of placement, and compressive strength cylinders cast for compressive strength determinations in accordance with the ASTM C39(9) procedure. Flexural strength can be determined using flexural strength prisms (ASTM C78)(10) or by splitting tensile tests (ASTM C496)(13) on cylinders. Due to the sensitivity of concrete pavement performance and durability to water-cement ratio, and the potential variability in RCM gradation, specific gravity, and absorption, particular attention should be given to these aggregate properties when using RCM in concrete pavement mixtures, and appropriate adjustments to the quantity of mixing water completed during concrete production. For RCA, environmental considerations have focused on leachability of contaminants and pH changes from RCA storage and use. Previous research conducted on the leachability Portland cement concrete used the Toxicity Characteristic Leaching Procedure. (24) Although leachability results were low,(24) the TCLP simulates a municipal landfill setting and not a beneficial use environment, so results would not be applicable to environmental considerations for beneficial use. More recent research employed a serial batch test (Dutch Pre-Standard NVV 5432). (25) This research concluded that well-cured Portland cement concrete released no detectable concentrations of antimony, arsenic, beryllium, cadmium, chromium, lead, mercury, nickel and selenium. (25) The internal alkaline nature of concrete is well known, but can change over time with weathering and age for numerous reasons (e.g., carbonation). RCA could also be alkaline, with potential pH values and changes similar to in-place concrete. Texas has also completed research in using RCA in mechanically stabilized earth (MSE) berms that involved thorough material characterization, pH measurements and an evaluation of use. (29,30) They concluded that pH and resistivity specifications for MSE wall backfill materials should be waived for crushed concrete, concrete structures that have suffered sulfate attack should not be crushed and used as backfill in MSE walls, and MSE walls with crushed concrete backfill should include adequate drains and high permittivity filter fabrics behind the wall to avoid drainage problems. (30) The potential for a pH and drainage issues leads some jurisdictions to require that RCA stockpiles be separated (a minimum distance) from water courses. There is a need to obtain long-term performance and life-cycle cost data for concrete made with processed RCM aggregates to assess its durability, performance, and expected service life. Limits on chloride and sulfate contents of concrete materials are well established. However, further investigation concerning the effect of other impurities that RCM may contain (other than chloride and sulfate) such as wood, asphalt, and earth on concrete performance is greatly needed. Also, there is a need for guidance regarding the monitoring and restriction of impurities in RCM. Further, for concretes affected by alkali-silica reactive or D-cracking, specific knowledge of the concrete is needed to assure its reclcled use is appropriate. For instance, the potential for continued ASR needs to be evalauted and if found to be probablamatic then the mix must be mitigated. Like wise crushing a D-cracked concrete may in fact eliminate D cracking in the new concrete however it may not. Criteria for evaluating both cases are lacking to assure the safe and risk free use of these special concretes. There is an essential need to develop appropriate specifications for the use of such materials. ACPA. Concrete Paving Technology: Recycling Concrete Pavement, American Concrete Pavement Association, Illinois , 1993. American Association of State Highway and Transportation Officials. Standard Specification "Fine Aggregate for Portland Cement Concrete," AASHTO Designation M6-65, Part I Specifications, 14th Edition, 1986. American Association of State Highway and Transportation Officials. Standard Specification for Materials, "Fine Aggregate for Portland Cement Concrete," AASHTO Designation: M 6-81, Part I Specifications, 14th Edition, 1986. American Association of State Highway and Transportation Officials. Standard Specification for Materials, "Coarse Aggregate for Portland Cement Concrete," AASHTO Designation: M80-77, Part I Specifications, 14th Edition, 1986. American Association of State Highway and Transportation Officials. Standard Specification for Materials, "Standard Sizes of Coarse Aggregate for Highway Construction," AASHTO Designation: M43-82 (1986), Part I Specifications, 14th Edition, 1986. ACI. "Guide to Durable Concrete," ACI Manual of Concrete Practice, ACI 201.R-77, Part 1, 1990. ACI. Recycling of Demolished Concrete and Masonry, RDCM.CT 95, American Concrete Institute, Detroit , Michigan 1995. ACI. "Standard Practice For Selecting Proportions for Normal , Heavy Weight, and Mass Concrete," ACI Manual of Concrete Practice, ACI 211.1-89, Part 1, 1990. ASTM C39. "Standard Test Method for Compressive Strength of Cylindrical Concrete Specimens," American Society for Testing and Materials,Annual Book of ASTM Standards, Volume 04.02, West Conshohocken , Pennsylvania . ASTM C78. "Standard Test Method for Flexural Strength of Concrete (Using Simple Beam with Third-Point Loading)," American Society for Testing and Materials, Annual Book of ASTM Standards , Volume 04.02, West Conshohocken , Pennsylvania . American Society for Testing and Materials. Standard Specification C452-85a, "Potential Expansion of Portland Cement Mortars Exposed to Sulfate," Annual Book of ASTM Standards, Volume 04.01, 1987. ASTM C289. "Standard Test Method for Potential Reactivity of Aggregates," American Society for Testing and Materials, Annual Book of ASTM Standards , Volume 04.02, West Conshohocken , Pennsylvania . ASTM C496-86. "Standard Test Method for Splitting Tensile Strength of Cylindrical Concrete Specimens," American Society for Testing and Materials, Annual Book of ASTM Standards, Volume 04.02, West Conshohocken , Pennsylvania . Collins, R. J. and S. K. Ciesielski. Recycling and Use of Waste Materials and By-Products in Highway Construction, National Cooperative Highway Research Program Synthesis of Highway Practice 199, Transportation Research Board, Washington, 1994. Frondistou-Yannas, S., "Waste Concrete as Aggregate for New Concrete," American Concrete Institute Journal, Vol. 14, No. 8, August 1977, pp. 373-376. Gonzalez, G.P. and Moo-Young, H.K. Transportation Applications of Recycled Concrete Aggregate, FHWA State of the Practice National Review, September 2004. Haas, R.G., W.R. Hudson, and J. Zaniewski. Modern Pavement Management , Krieger Publishing Company Melbourne , Florida , 1994. Handbook for the Identification of Alkali-Silica Reactivity in Highway Structures, SHRP-C/FR-91-101, Strategic Highway Research Program, National Academy of Sciences Washington , D.C. , 1991. Recycling of Demolished Concrete and Masonry, RILEM, International Union of Testing and Research Laboratories for Materials and Structures, E and FN Spon, New York , 1992. Shahin, M.Y. and S. D. Kohn. Development of Pavement Condition Rating Procedures for Roads, Streets and Parking Lots - Volume 1 Condition Rating Procedure, Technical Report M-268, Construction Engineering Research Laboratory, United States Corps of Engineers, 1979. Sri Ravindrarajah, R., C.T. Tam Be, et al. Properties of Concrete Made with Crushed Concrete as Coarse Aggregate, National University of Singapore , 1985. Yrjanson, W. Recycling of Portland Cement Concrete Pavements, National Cooperative Highway Research Program Synthesis of Highway Practice 154, Transportation Research Board, Washington, D.C., December 1989. Kreitch, A.J. Leachability of Asphalt and Concrete Pavements, Heritage Research Group Report, Indianapolis , Indiana , March 1992. Recycled concrete aggregate (RCA) can be used as coarse and/or fine aggregate in granular base. This process saves valuable resources and currently 38 states allow RCA to be used as a granular base. (9,10,11) The properties of processed RCA generally exceed the minimum requirements for conventional granular aggregates. Being a 100 percent crushed material, processed RCA aggregates "lock up" well in granular base applications, providing good load transfer when placed on weaker subgrade. The lower compacted unit weight of RCA aggregates compared with conventional mineral aggregates results in higher yield (greater volume for the same weight), and is therefore economically attractive to contractors. For some reconstruction projects, on-site processing and recycling of RCA are likely to result in economic benefits through reduced aggregate hauling costs. Some of the positive features of RCA aggregates in granular base applications include the ability to stabilize wet, soft, underlying soils at early construction stages, good durability, good bearing strength, and good drainage characteristics. There is recent evidence that the use of some unsuitable or improperly processed RCA aggregate can adversely affect pavement subdrainage systems and pavement performance. (13) Tufa-like (white, powdery precipitate) precipitates have been reported by a number of agencies to have clogged subdrains and blinded geotextile filters. (13) The tufa precipitate appears to be Portlandite from unhydrated cement and/or calcium carbonate (CaCO3), formed by the chemical reaction of atmospheric carbon dioxide with the free lime (CaO) in the RCA. However, the problem is not universal, and many pavements with RCA granular base are reported to be functioning satisfactorily without any apparent tufa formation. Following the initial crushing of concrete rubble in a jaw crusher and removal of any steel by magnetic separation, RCA must be crushed and screened to the desired gradation using conventional aggregate processing equipment. Where RCM is available from different sources or concrete types, it should either be blended or maintained in separate stockpiles to ensure consistent material properties. Washing of RCA aggregates is required by some agencies (Ohio, for example) to remove the dust as a measure to reduce potential tufa formation. To control tufa precipitate formation, only suitable RCA that does not contain appreciable unhydrated cement or free lime should be used for granular base applications. Some of the engineering properties of RCM that are of particular interest when RCM is used as a granular base material include gradation, absorption, specific gravity, stability, strength, durability, and drainage. Gradation: RCA must be crushed and screened to satisfy AASHTO M147(2) and ASTM D2940(7) requirements for aggregates. Stability: RCA has high friction angle, typically in excess of 40 o and consequently demonstrates good stability and little postcompaction settlement. Durability: RCA aggregates generally exhibit good durability with resistance to weathering and erosion. RCA is nonplastic, and is not susceptible to frost. Drainage Characteristics: RCA (mainly coarse fraction) is free draining and is more permeable than conventional granular material because of lower fines content. Processed RCA aggregates generally satisfy the requirements of AASHTO M147(10) and ASTM D2940. (7) Processed RCA is covered by conventional granular aggregate specifications in a number of jurisdictions. Standard AASHTO pavement structural design procedures can be employed for granular base containing RCA aggregates. It is recommended that the appropriate structural number for RCA aggregates should be established by resilient modulus testing. The same methods and equipment used to store or stockpile conventional aggregates are applicable for RCA. However, additional care is required in stockpiling and handling RCM aggregates to avoid segregation of coarse and fine RCA, such as stock pile watering. The same methods and equipment used to place and compact conventional aggregate can be used to place and compact RCA. Wash the processed RCM aggregates to remove dust from the coarse particles. Ensure that any geotextile fabric surrounding the drainage trenches (containing the subdrains) does not intersect the drainage path from the base course (to avoid potential plugging with fines). For RCA, environmental considerations have focused on leachability of contaminants and pH changes from RCA storage and use. Previous research conducted on the leachability Portland cement concrete used the Toxicity Characteristic Leaching Procedure. (15) Although leachability results were low,(15) the TCLP simulates a municipal landfill setting and not a beneficial use environment, so results would not be applicable to environmental considerations for beneficial use. More recent research employed a serial batch test (Dutch Pre-Standard NVV 5432). (16) This research concluded that well-cured Portland cement concrete released no detectable concentrations of antimony, arsenic, beryllium, cadmium, chromium, lead, mercury, nickel and selenium. (16) The internal alkaline nature of concrete is well known, but can change over time with weathering and age for numerous reasons (e.g., carbonation). RCA could also be alkaline, with potential pH values and changes similar to in-place concrete. Texas has also completed research in using RCA in mechanically stabilized earth (MSE) berms that involved thorough material characterization, pH measurements and an evaluation of use. (22,23) They concluded that pH and resistivity specifications for MSE wall backfill materials should be waived for crushed concrete, concrete structures that have suffered sulfate attack should not be crushed and used as backfill in MSE walls, and MSE walls with crushed concrete backfill should include adequate drains and high permittivity filter fabrics behind the wall to avoid drainage problems. (23) The potential for a pH and drainage issues leads some jurisdictions to require that RCA stockpiles be separated (a minimum distance) from water courses. Further investigation of the propensity for tufa formation of RCA aggregates in granular base is needed. This should also include the development of standard methods to assess the suitability of RCA aggregates for base course applications where subdrains are used. Currently research is focused on some of the testing methods for RCA. It is not clear whether or not standard testing methods for virgin aggregate is applicable to RCA. American Society for Testing and Materials. Standard Specification D2940-92, "Graded Aggregate Material for Bases and Subbases for Highways or Airports," Annual Book of ASTM Standards, Volume 4.03, West Conshohocken , Pennsylvania , 1996. Collins, R. J. and S. K. Cielieski. Recycling and Use of Waste Materials and By-Products in Highway Construction, National Cooperative Highway Research Program Synthesis of Highway Practice 199, Transportation Research Board, Washington, 1994. Gupta, J. D., W. A. Kneller, R. Tamirisa, and E. Skrzypczak-Jankun. "Characterization of Base and Subbase Iron and Steel Slag Aggregates Causing Deposition of Calcareous Tufa in Drains," Transportation Research Record No. 1434, 1994. Gupta, J. D. and W. A. Kneller. Precipitate Potential of Highway Subbase Aggregates, Report No. FHWA/OH-94/004 prepared for the Ohio Department of Transportation, November 1993. Hanks, A. J. and E. R. Magni. The Use of Recovered Bituminous and Concrete Materials in Granular Base and Earth, Ontario Ministry of Transportation Report MI-137, Downsview, Ontario, 1989. Petrarca, R.W. and V.A. Galdiero, "Summary of Testing of Recycled Crushed Concrete," Transportation Research Board No. 989, pp. 19-26, Washington , D.C. , 1984. Senior, S. A. S. I. Szoke, and C. A. Rogers, " Ontario 's Experience with Reclaimed Materials for Use as Aggregates," Presented at the International Road Federation Conference, Calgary , Alberta , 1994. Although the use of recycled concrete aggregate (RCA) in embankments or fill may not make the best use of the high quality aggregates associated with RCA, where no other applications are readily available, RCA can be satisfactorily used in this application. RCA aggregates are considered by many specifying agencies to be conventional aggregate. It requires minimal processing to satisfy the conventional soil and aggregate physical requirements for embankment or fill material. The lower compacted unit weight of RCA aggregates compared with conventional mineral aggregates results in higher yield (greater volume for the same weight), and is therefore economically attractive to contractors. In addition, for large reconstruction projects, on-site processing and recycling of RCA is likely to result in economic benefits through reduced aggregate hauling costs. RCA has demonstrated satisfactory performance as an embankment or fill material. Its use is covered by special provisions to specifications in a number of jurisdictions. Desirable attributes of RCA for use in embankments or fill include high friction angle, good bearing strength, negligible plasticity, and good drainage characteristics. Due to its high alkalinity, RCA in contact with aluminum or galvanized steel pipes can cause corrosion in the presence of moisture. A potential for tufa-like precipitates to leach from RCA in granular base applications has been described in the literature,(11) and may also be a consideration in embankment or fill applications. Prior to its use, any reinforcing steel must be removed and RCA must be broken or crushed and screened to satisfy the maximum size and gradation requirements for use in embankment construction. Washing of RCA aggregates is required by some agencies to remove the dust as a measure to reduce tufa formation potential. To control tufa precipitate formation, only suitable RCA that does not contain significant quantities of unhydrated cement or free lime should be used for embankment or fill applications. Some of the engineering properties of RCA that are of particular interest when RCA is used as an embankment or fill material include gradation, specific gravity, stability, strength, durability, drainage, and corrosivity. Gradation: RCA must be crushed and screened to satisfy AASHTO M145(2) and ASTM D2940(8) gradation requirements for embankment or fill aggregates. Stability: RCA has high friction angle, typically in excess of 40° and consequently demonstrates good stability and little postcompaction settlement. Durability: RCA aggregates generally exhibit good durability with resistance to weathering and erosion. Drainage Characteristics: RCA (mainly coarse fraction) is free draining (more permeable than conventional granular material due to lower fines content). RCA is nonplastic and is not susceptible to frost. The design requirements for RCA in embankment construction are the same as for conventional aggregates. There are no standard specifications covering RCA use as embankment or fill material. Structural design procedures for embankments or fill containing RCA are the same as design procedures for embankments or fill containing conventional materials. The same methods and equipment used to store or stockpile conventional aggregates are applicable for reclaimed concrete material. Some jurisdictions ( Ontario , Canada , for example) may restrict stockpiling and placement of RCA near watercourses to minimize the impact of the alkaline leachate on ambient water quality. Appropriate procedures may also be required to avoid segregation of coarse and fine materials during handling and storage. These include stockpile construction using radial stackers, with remixing using a front-end loader or bulldozer prior to load-out, and care during load-out and placement. Due to their high angularity, additional effort (for instance using vibratory rollers) may be required to compact RCA to its maximum density. The processor may be required to satisfy moisture content criteria according to AASHTO T99,(7) in order to achieve good compactibility. This usually requires the addition of water during placement and compaction. For RCA, environmental considerations have focused on leachability of contaminants and pH changes from RCA storage and use. Previous research conducted on the leachability Portland cement concrete used the Toxicity Characteristic Leaching Procedure. (16) Although leachability results were low,(16) the TCLP simulates a municipal landfill setting and not a beneficial use environment, so results would not be applicable to environmental considerations for beneficial use. More recent research employed a serial batch test (Dutch Pre-Standard NVV 5432). (17) This research concluded that well-cured Portland cement concrete released no detectable concentrations of antimony, arsenic, beryllium, cadmium, chromium, lead, mercury, nickel and selenium. (17) The internal alkaline nature of concrete is well known, but can change over time with weathering and age for numerous reasons (e.g., carbonation). RCA could also be alkaline, with potential pH values and changes similar to in-place concrete. Texas has also completed research in using RCA in mechanically stabilized earth (MSE) berms that involved thorough material characterization, pH measurements and an evaluation of use. (21,22) They concluded that pH and resistivity specifications for MSE wall backfill materials should be waived for crushed concrete, concrete structures that have suffered sulfate attack should not be crushed and used as backfill in MSE walls, and MSE walls with crushed concrete backfill should include adequate drains and high permittivity filter fabrics behind the wall to avoid drainage problems. (22) The potential for a pH and drainage issues leads some jurisdictions to require that RCA stockpiles be separated (a minimum distance) from water courses. Although problems associated with tufa precipitate formation in embankments containing RCA have not been identified, a study of the subject would provide useful technical data to better define the nature and degree of the problem, and to affirm the use of RCA in embankment construction. ACPA. "Concrete Paving Technology: Recycling Concrete Pavement," American Concrete Pavement Association, Illinois , 1993. American Association of State Highway and Transportation Officials, Standard Method of Test, "Density of Soil and Soil-Aggregate in Place by Nuclear Methods (Shallow Depth)," AASHTO Designation: T238-86, Part II Tests, 14th Edition, 1986. American Society for Testing and Materials. Standard Specification D2940-92, "Graded Aggregate Material for Bases and Subbases for Highways or Airports," Annual Book of ASTM Standards, Volume 04.03, West Conshohocken , Pennsylvania , 1996. Gupta, J. D., W. A. Kneller, R. Tamirisa, and E. Skrzypczak-Jankun, "Characterization of Base and Subbase Iron and Steel Slag Aggregates Causing Deposition of Calcareous Tufa in Drains, " Transportation Research Record No. 1434, 1994. Mabin, S. M. "Recycled Concrete Aggregate - New York State 's Experience." Recovery and Effective Reuse of Discarded Materials and By-Products for Construction of Highway Facilities, FHWA/EPA Symposium Proceedings, Denver , Colorado , October 1993. Petrarca, R.W. and V.A. Galdiero, "Summary of Testing of Recycled Crushed Concrete," Transportation Research Record No. 989, pp. 19-26, Washington , D.C. , 1984. Senior, S. A., S. I. Szoke, and C. A. Rogers, " Ontario 's Experience with Reclaimed Materials for Use as Aggregates." Presented at the International Road Federation Conference, Calgary , Alberta , 1994.